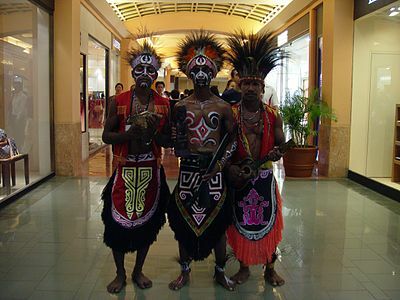 Papuan peoples are the indigenous peoples of New Guinea and neighbouring islands, speakers of the Papuan languages. They are distinguished genetically, culturally and/or linguistically from the Austronesians of Melanesia, speakers of Austronesian languages introduced into New Guinea and nearby islands about 3,500 years ago. The Papuans are considered to be the descendants of the earliest human inhabitants of New Guinea and surrounding islands. These original inhabitants first arrived approximately 40,000 - 50,000 years ago, at a time when the island was connected to the Australian continent via a land bridge, forming the landmass known as Sahul. These peoples had made a sea-crossing from the islands of Wallacea and Sundaland (the present Malay Archipelago) subsequent to the initial dispersal of peoples from Africa around 60,000 years ago. Austronesian peoples are thought to have arrived at a considerably later date, approximately 3,500 years ago, as part of a gradual seafaring migration from Southeast Asia, likely originating in Taiwan. These peoples colonized many of the offshore islands to the west, north and east of New Guinea, such as New Ireland and New Britain, with settlements also on the coastal fringes of the main island in places. They intermixed to a small degree with some of the indigenous, coastal Papuan populations, and thus became genetic and/or linguistic ancestors to Austronesian-speaking groups of Melanesia, but largely not of Papuan-speaking groups. A 2008 study on the genetic structure of Pacific Islanders found groups who speak Papuan languages to be particularly divergent from the other populations, and to be internally homogeneous. By contrast, a minority of island populations in Melanesia who were speakers of Austronesian languages had indications of a small shared genetic ancestry with Polynesians and Micronesians. This “Austronesian” genetic signature, always below 20%, was detected in less than half of the Melanesian groups that speak Austronesian languages, while being entirely absent in Papuan groups. Other studies have similarly found Austronesian genetic admixture to be largely or entirely absent from Papuan populations, but to be at levels of around 20% in Austronesian-speakers of Melanesia. In a 2005 study of ASPM gene variants, Mekel-Bobrov et al. found that the Papuan people have among the highest rate of the newly evolved ASPM Haplogroup D, at 59.4% occurrence of the approximately 6,000-year-old allele. While it is not yet known exactly what selective advantage is provided by this gene variant, the haplogroup D allele is thought to be positively selected in populations and to confer some substantial advantage that has caused its frequency to rapidly increase. Main Y-DNA Haplogroups of Papuan people are Haplogroup K2b1 (Y-DNA) and Haplogroup C1b2a. Admixture with archaic humans, known as the Denisovan hominin, which has been detected in aboriginal populations of southeast Asia, has also been found to be at its highest proportions in Papuan populations, with an average gene flow of approximately 4.6%. Language families of New Guinea, the North Moluccas, and the Lesser Sunda Islands according to a 2018 classification by Timothy Usher. Papuan languages are a geographic grouping of the non-Austronesian and non-Australian languages spoken on the western Pacific island of New Guinea, and neighbouring islands, by around 4 million people. It is a strictly geographical or areal grouping, and does not imply a genetic relationship. Besides the Austronesian languages, there are some 800 languages in New Guinea, divided into perhaps sixty small language families, with unclear relationships to each other or to any other languages, plus a large number of language isolates. The majority of the Papuan languages are spoken on the island of New Guinea, with a significant number also spoken in the neighbouring Bismarck Archipelago, Bougainville Island and the Solomon Islands to the east, and in Halmahera, Timor and the Alor archipelago to the west. One Papuan language, Meriam, is spoken within the national borders of Australia, in the eastern Torres Strait. The only Papuan languages with official recognition are those of East Timor. ^ "Kewarganegaraan, Suku Bangsa, Agama, Dan Bahasa Sehari-Hari Penduduk Indonesia". Badan Pusat Statistik. 2010. Retrieved 18 July 2017. ^ a b c d Friedlaender J, Friedlaender FR, Reed FA, Kidd KK, Kidd JR (2008-01-18). "The Genetic Structure of Pacific Islanders". PLoS Genetics. 4 (3): e19. doi:10.1371/journal.pgen.0040019. PMC 2211537. PMID 18208337. ^ a b c d e Jinam, Timothy A.; Phipps, Maude E.; Aghakhanian, Farhang; Majumder, Partha P.; Datar, Francisco; Stoneking, Mark; Sawai, Hiromi; Nishida, Nao; Tokunaga, Katsushi; Kawamura, Shoji; Omoto, Keiichi; Saitou, Naruya (August 2017). "Discerning the Origins of the Negritos, First Sundaland People: Deep Divergence and Archaic Admixture". Genome Biology and Evolution. 9 (8): 2013–2022. doi:10.1093/gbe/evx118. ^ "Ongoing Adaptive Evolution of ASPM, a Brain Size Determinant in Homo sapiens", Science, 9 September 2005: Vol. 309. no. 5741, pp. 1720–1722. 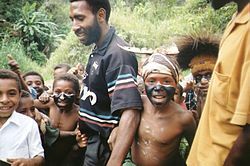 ^ "Papuan". www.languagesgulper.com. Retrieved 2017-10-15. This page was last edited on 21 April 2019, at 05:52 (UTC).